Competition kicked off Monday on Dollar Mountain as Sun Valley Resort became the third and final stop on the 2013 U.S. Revolution Tour for snowboarders and skiers. The five-day event March 17-22 features snowboard and skier halfpipe, slopestyle and cross at Dollar. Monday’s races were snowboard boardercross for men and women, plus ski cross for men and women. Michael Perle, 19, of Saddle River, N.J. and Vermont’s Stratton Mountain School won men’s boardercross over Billy Pettengill. Perle also won a Nor-Am Cup boardercross Feb. 6 at Killington, Vt. and was ninth in SBX at the 2012 FIS Junior World Championships. Alaska’s Rosina Mancari, 19, of Steamboat Springs (Colo.) Winter Sports Club took the women’s SBX race over Alyssa Dolgin. 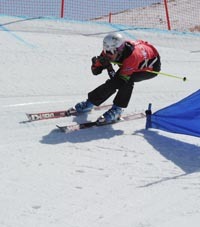 Mancari, from Anchorage, placed 12th in women’s SBX at the 2012 Junior World meet in Sierra Nevada, Spain. Skier cross winners Monday were Sun Valley Ski Education Foundation (SVSEF)/Whitman College alumnus Langely McNeal, 29, of Ketchum and Grant Ketels, 17, of Reno, Nev. and Olympic Valley Freeride and Freestyle Team. Sun Valley’s Tyler Chandler and Tanner Josey went 2-3 in ski cross. “It is extremely exciting knowing the level of riding and skiing that is going to be on display,” SVSEF Snowboard Director Andy Gilbert said about this week’s tour stop. Now in its ninth season, the “Rev Tour” is designed to serve as a stepping stone for athletes making the transition from competing at the grassroots level to the elite level. SVSEF athletes Hannah Haupt (FS), Ryan Roemer (SB), Chase Josey (SB) and Trevor Hattabaugh (SB) were due to compete in halfpipe, slopestyle and cross. Skiers Perry Boyle, Hayes Gilman and River Kelly are slated to race as well. Gilbert expected close to 300 athletes to participate. He hopes the community watches and supports the event. “The halfpipe is one of the most spectator-friendly venues I have seen. You can line either side of the hillsides and see the whole pipe. Dollar is like a giant amphitheater. You don’t even have to put on your skis to see all of the events,” he said. SVSEF Freestyle Director Andy Ware echoed Gilbert’s hopes that the event will be well attended by fans. ( Today, Wednesday: Ski and snowboard slopestyle heats and finals, 9:30 a.m. to 4 p.m.
( Thursday, March 21: Ski and snowboard halfpipe heats and finals, 9:30 a.m. to 4 p.m.
( Friday, March 22: Ski and snowboard slopestyle heats and finals, 9:30 a.m. to 4 p.m.